After Brussels' downtown pedestrian zone, it's Schuman's turn to be transformed from a traffic-clogged roundabout into a space for cyclists and pedestrians. 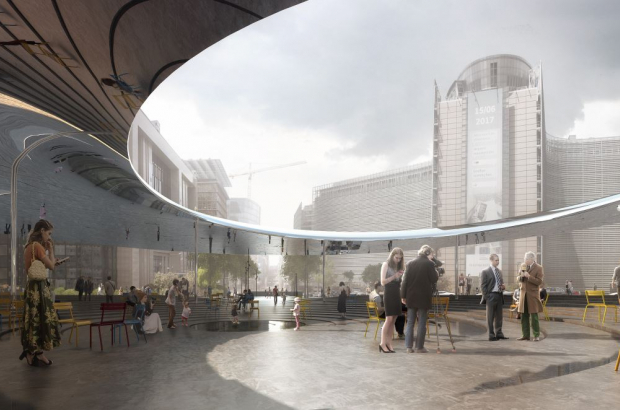 A joint Belgian-Danish architectural project has been selected from 20 applicants to redesign the busy intersection, creating an open-air meeting space under a metal canopy, and a pedestrian area stretching from the European Council's new building to the edge of the Cinquantenaire park. Traffic will still be allowed along the main city centre-bound route from Avenue de Cortenbergh to Rue de la Loi. It will be impossible for cars to cross the Schuman square from or towards Rue Froissart or Avenue d'Auderghem. The Rue de la Loi stretch between Schuman and Cinquantenaire park will be fully pedestrianised and the Avenue de la Joyeuse Entrée next to Cinquantenaire park will become a two-way street. Five Stib bus lines - including the airport bus - will need to rerouted. Brussels mobility minister Pascal Smet: "We are going from a city for cars to a city for people. Schuman will become a real urban square where residents and visitors can meet. Finally this emblematic spot is given the quality and look it deserves." The Brussels region launched an international competition two years ago to redesign the traffic-clogged junction. Five of the 20 bids were shortlisted and assessed by an independent jury. Alain Hutchinson, the Brussels Commissioner for Europe, said: "Schuman square is an iconic site of EU decision-making. After years of neglect, this site deserves a redesign." Building permits are expected to be granted by the end of next year, with a view to works starting in 2019.